In the world of B2B technology marketing, we talk about campaigns, we care about inbound leads, we obsess over content marketing. SEO is someone else’s job, right? But what if we told you that search was actually hugely important for your campaigns? And that search engine optimised campaigns were massively influential for your brand? And that this leads to a merry cycle of benefits for both your future campaigns and your brand as a whole? Many are sceptical and won’t touch SEO with a bargepole, but let us bust some myths around the importance of campaign search presence and introduce you to a colourful concept that will change your view of Google. Google has gotten a lot smarter over the years. Nowadays, it recognises that your landing page is (hopefully) on the same URL as your company website. Even if there are no links to your landing environment from the main site, your content is talking about your company and Google “knows” you’re part of the same thing. Therefore, the better search presence your main site has, the more it will benefit your campaigns as they can ride on the wave of Google popularity. What’s more, you can take this into your own hands as your campaigns are actually very powerful in boosting your brand’s overall search presence (read on to find out how). This inherent relationship means that it is time to re-evaluate where your campaigns stand in relation to your wider brand. SEO isn’t just about the company website anymore. Have a think. The reason we perform SEO in the first place is to appear at the top of the search results. But what did the SERP (Search Engine Results Page) look like ten years ago compared to today? In 2006, the search result was a simple list of web pages that Google tried to present in order of usefulness to the user. So to triumph in Google back then, yes SEO was the name of the game and company websites were the only players. Today, search results look very different and there is more than enough space for your campaign alongside the company website. Google wants to pull enough information together from different sources to become the answer itself, rather than a directory of resources. Today, there are tweets and news and ads and landing pages; in fact there is a large and growing list of SERP features that Google uses to create the most efficient, useful answer for users, and most of them draw elements from your campaign. 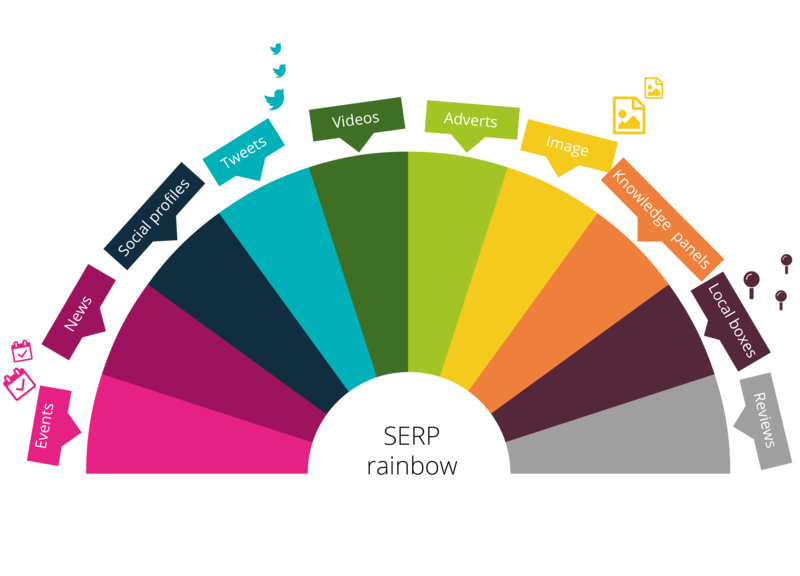 We’re calling this the SERP rainbow. The SERP rainbow is a brand’s unique combination of search results for a given search term. We’ve already established that boosting the search presence of your brand’s website will also boost your campaigns’ search presence. But there are also direct benefits of your campaigns populating a healthy SERP rainbow. If your campaigns look to fill as many segments of the SERP rainbow as possible, upon the right Google search, your brand will dominate. Look at this example from Xero. A brand search renders such a full and complex result that there is no room for any competitors above the fold. The user has options of pursuing a live Twitter conversation, the latest news results, a multitude of social profiles, and right at the top, the advert. 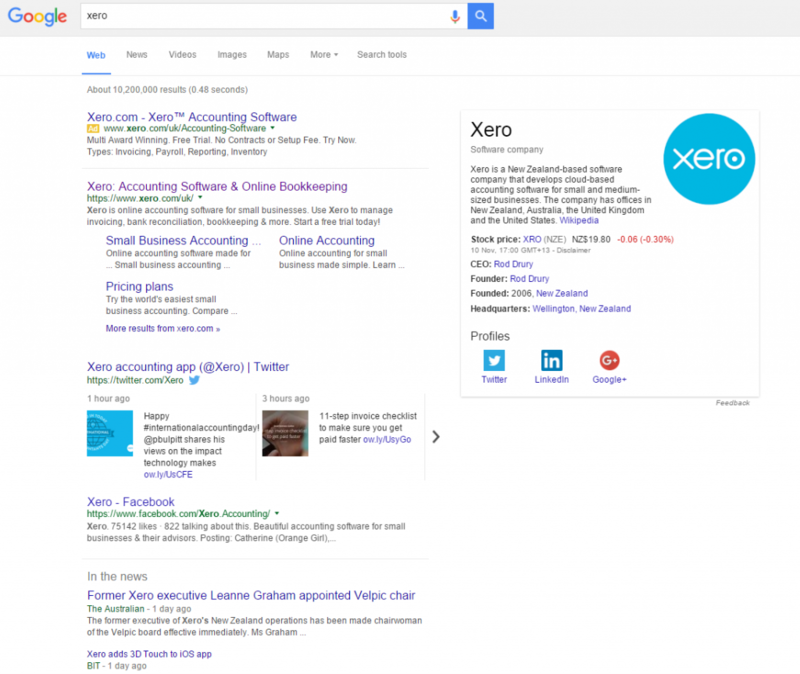 Xero have successfully tied their campaigns in with their search marketing to create a SERP rainbow that builds trust in the user. The beauty of Google now is that there is no waiting (or very little). Gone are the days of cooking up SEO techniques to watch your site creep up the search rankings. Now Google takes live events such as tweets and news from around the web as they happen, and the rest of your campaign content isn’t far behind. This gives you reason to search engine optimise every element of your campaign. 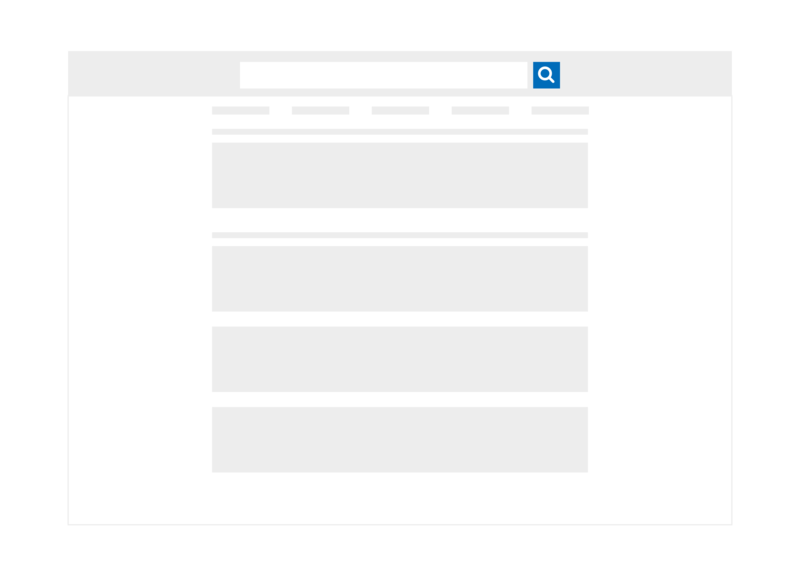 For example, if your campaign includes video, Google no longer looks for the webpage that your video is on, but looks to present the actual video itself in the search results. So, if that video is search engine optimised, it can enjoy a place in the SERP rainbow and your campaign will benefit from the search traffic. The SERP rainbow may not be in your campaign plan at the moment, but it can only bring benefits to you and your customers. It presents an immense opportunity that many campaign managers are missing out on because they don’t see the benefits. Prioritising your search presence puts the power back into the hands of your customers to re-enter themselves to your campaign at any time, rather than waiting for communications from you at each stage. What’s more, it gives customers the choice to consume information in their chosen format—social media, website, video—all from one starting point, the Google search. Even if search presence isn’t on your list of key performance indicators this year, there is definitely merit in keeping a close eye on the development of your SERP rainbow. It doubles as a tool to identify both areas for improvement and windows of opportunity, a benchmark for you to assess the success of your integrated campaigns. For example, if none of your press coverage appears in the search results, why not? If your tweets are appearing in every search, what wisdom can your social team pass on? The SERP rainbow is not just a superficial reverie, but a solid gauge of the impact of your campaigns and how individual communications tie in with the bigger picture. Think of your SERP rainbow as being the physical embodiment of your fully integrated campaigns – each component of the marketing mix literally appears alongside each other. Therefore, each component should complement the others and promote a unified brand message. Teams should be talking to one another, making strategic decisions that consider all channels, and working together to capitalise on the SERP rainbow opportunities. 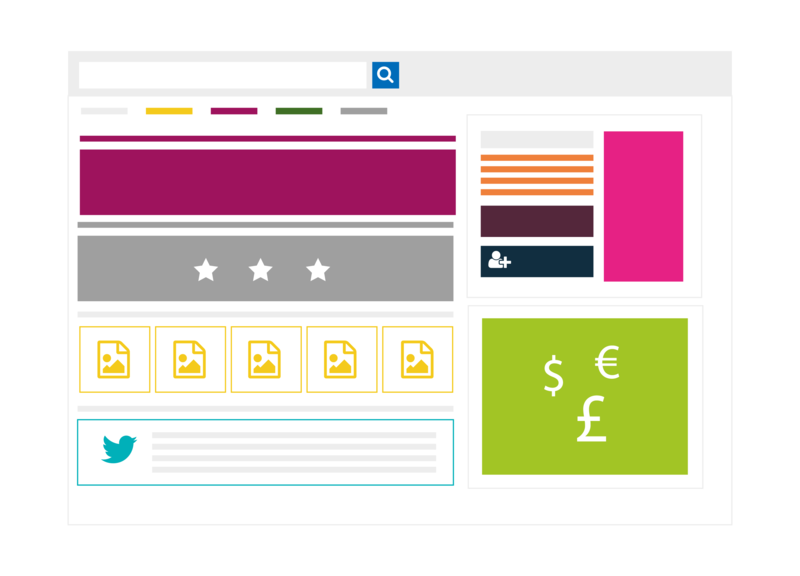 How will my customers find my campaign via search? Is each element of my campaign optimised for search engines? Are there any parts of my campaign that are more search worthy than others? How can I leverage the global site’s SEO to influence my campaign? Does my campaign cover every part of my ideal SERP rainbow? Is my messaging consistent across every channel where my campaign is? Is my campaign consistent with the company brand? Can the SEO team improve on anything? Disclaimer: We know there are other search engines but, for the purpose of this blog post, we focused on Google as it dominates market share in the UK in 2015.